Having a successful hunt means different things to different people. To some, a successful hunt means enjoying the sights and sounds of nature, the camaraderie around the campfire, delicious food and a comfortable camp and consider a kill a bonus. Yet, others consider a hunt successful only if the pursued game animal is harvested. Our goal is to take you into country that game usually frequents, but we cannot guarantee you will kill game or that the game will be there at any specific time. As weather conditions which play a major role in game behavior is out of our control, so is the physical condition of the hunter and his or her ability to walk, ride horseback, climb or shoot accurately. What we can guarantee is that we will work hard to make your hunt successful regardless of your definition of success. We will utilize our knowledge and experience to give you the best possible opportunity to harvest game. All of our hunts are fair chase hunts. 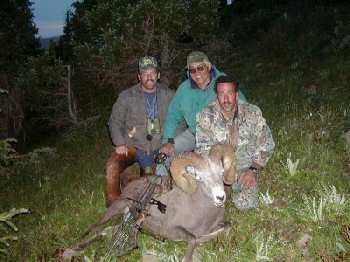 Our hunts are conducted in the Santa Fe National Forest and the Pecos Wilderness. Travel in the wilderness area is limited to foot or horseback only. Elevations in the area range from 7,000 feet in the foothills to over 13,000 feet. The pristine Sangre de Cristo mountains offer countless acres of beautiful scenery for your enjoyment. There is abundant wildlife in the area including deer, elk, big horn sheep, black bear, cougar, bobcat, turkey and grouse as well as other small game. We pride ourselves in providing our guests with clean, comfortable camps. Our camps include large waterproof wall tents heated with "sheepherder" stoves, cots, lanterns, a portable shower for extended trips and a kitchen tent with a dining table and chairs . The comfort that these tents and equipment provide, allow the hunter to get the needed rest and relaxation needed to put your energies into hunting. Also, should we get snow or other inclement weather during the hunt, you can easily dry out clothing and prepare yourself for the next days` hunt. Meals are genuine, country style and native New Mexican dishes cooked fresh in camp. Our cooks constantly strive to provide clients with fare that is usually found only in fine restaurants. A variety of snacks and drinks are always handy. Meals can be modified to your tastes or diet. You will find our employees, equipment and livestock to be some of the best in the state. We hire only those guides with intimate knowledge of horses, the pursued game, and the area we are hunting. With our 26 head of sure-footed mountain horses and accompanying tack and equipment, we have plenty of resources to accommodate hunters and guests without any problem. We look forward to providing you with a high quality wilderness adventure. References will gladly be furnished to you upon request.